Our family goes to Disneyland several times a year. Last year we went a record (for us) 6 times! We have stayed at a lot of hotels, some nice (the Grand Californian) and some not so nice (Del Sol). We usually like to stay very close to the park so we can walk to and from the hotel easily, but being a mile away wasn’t bad at all. We drive to the park, but you could walk if you wanted to. Last week our family had the privilege of staying at a My Castle House near Disneyland. We stayed at home #12 which is a 4 bedroom house with a full kitchen and 3 bathrooms (see the video for a walk through). It was about a mile away from the park. We invited friends to come with us, so there were 2 families of 6 staying in this house comfortably. 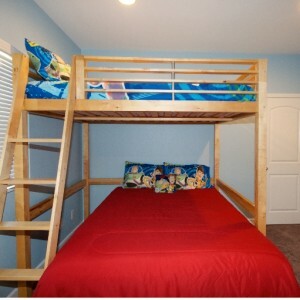 There were a lot of beds and there were hide-a-mats in the closets that were comfortable to sleep on for the kids. I have to say no other hotel we have stayed at in Anaheim has been as nice as this was. It will be really hard to stay in a “regular” hotel again, honestly! I loved the full kitchen, disney decor, bunk rooms, amazing pool, living room, and the master bedroom was bigger than some hotel rooms we have stayed in. I didn’t try all of the beds, but the master bed was very comfortable. See the costs for this house here. We booked in under 6 weeks, so we got special pricing. There is a $250 cleaning fee charged at the end of your stay. 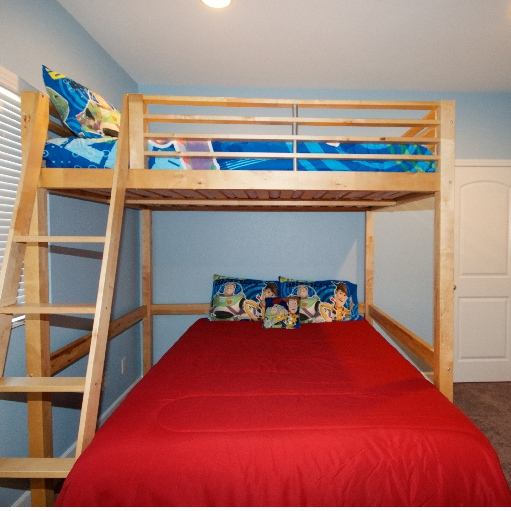 If the price is too high for you, I would suggest splitting the cost with another family which makes this home about the same price as other hotels in Anaheim, but you will have much more space, privacy, quiet, and very comfortable beds. The managers were very available and willing to help as well. These houses would be awesome for a family reunion as they have several houses right next to each other that share the pool and splashpad. Daniella it’s nice to meet a fellow Disney fan! I wish I lived as close as you! Hi! I love it! I go to Disneyland quite a lot too! I live In Los Angeles zip code:90002, and It is about 40 minutes away from Disneyland. I have 2 kids, Kiara~ 4 and Jayla~ 10.